Peppermint oil is derived from the leaves of the peppermint plant or Mentha pipertita, a hybrid of the water mint and spearmint plants, and M. arvensis var. piperascens, a plant from the Labiatae family. Studies have found that the fresh, sharp, menthol smell of Peppermint essential oil induces a cooling sensation,helps ease tensions.The oil is is effective in relieving anxiety, pain, and vomiting, headaches,muscular aches and pains.The aroma of peppermint oil has been shown to raise alertness and improve memory,concentration and focus on cognitive tasks. 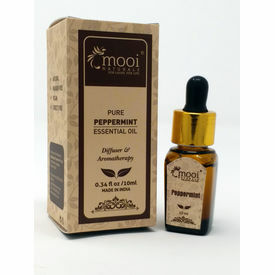 For Skin : Adding a few drops of this oil into your daily beauty regimen will promotes healthy skin. It contains menthol that has a cooling effect and at the same time, works to brighten up the dull skin.The Oil helps to tone the skin, treats acne ,minimizes pores, reduces swelling and restores skin elasticity. For Hair : Peppermint oil has astringent properties that helps to normalize the sebum secretion and cools the scalp.The PH balance formula in peppermint oil is beneficial for Hair and Scalp! Its moisturizing properties help in treating dry scalp and dandruff and gets beautiful hair and problem-free scalp. It heals the scalp and prevents itching too.The Oil makes hair roots stronger and helps in promoting Hair growth. On Mind : Emotionally and spiritually, the essential oil of peppermint is uplifting and rejuvenating to the heart and mind.The scent invigorates the mind and senses and helps a person rise above stress, pain, sadness, or fear, and regain the sense of zest and joy for Life and their role in it. Theraupatic Benefits : The theraupatic properties of Peppermint oil sorts out coughs, headaches, nausea and also has value as an insect repellant. Peppermint oil is derived from the leaves of the peppermint plant or Mentha pipertita, a hybrid of the water mint and spearmint plants, and M. arvensis var. piperascens, a plant from the Labiatae family. Studies have found that the fresh, sharp, menthol smell of Peppermint essential oil induces a cooling sensation,helps ease tensions.The oil is is effective in relieving anxiety, pain, and vomiting, headaches,muscular aches and pains.The aroma of peppermint oil has been shown to raise alertness and improve memory,concentration and focus on cognitive tasks. 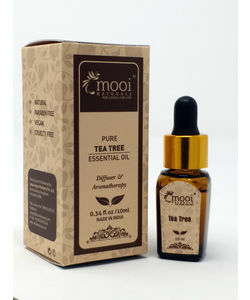 For Skin : Adding a few drops of this oil into your daily beauty regimen will promotes healthy skin. 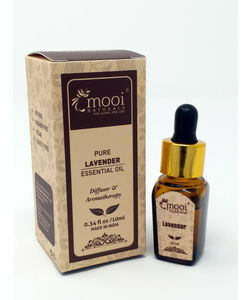 It contains menthol that has a cooling effect and at the same time, works to brighten up the dull skin.The Oil helps to tone the skin, treats acne ,minimizes pores, reduces swelling and restores skin elasticity. For Hair : Peppermint oil has astringent properties that helps to normalize the sebum secretion and cools the scalp.The PH balance formula in peppermint oil is beneficial for Hair and Scalp! Its moisturizing properties help in treating dry scalp and dandruff and gets beautiful hair and problem-free scalp. It heals the scalp and prevents itching too.The Oil makes hair roots stronger and helps in promoting Hair growth. On Mind : Emotionally and spiritually, the essential oil of peppermint is uplifting and rejuvenating to the heart and mind.The scent invigorates the mind and senses and helps a person rise above stress, pain, sadness, or fear, and regain the sense of zest and joy for Life and their role in it. Theraupatic Benefits : The theraupatic properties of Peppermint oil sorts out coughs, headaches, nausea and also has value as an insect repellant.